There is no love quite like the love of a pet. They’re always there for us, when we’re sick, sad, or lonely. They’ll play with us and keep us company. They are therapists and confidants, best friends and playmates. Unconditional love for a small adoption fee. When I was about seventeen, my neighbors adopted a kitten for their daughter and named him Samson. Children can be fickle creatures, and it turned out that their daughter wasn’t hugely interested in having a cat, so Samson was pretty much left to his own devices. 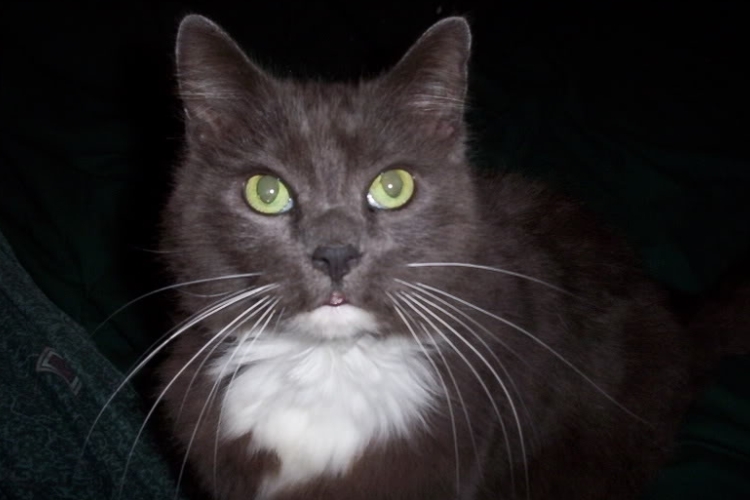 He was a longhair, mostly blue-gray, but with a white patch on his chin down to his tummy, and on the tips of his paws. He had beautiful, piercing green eyes. I was pretty much left to my own devices as well. My dad had just been arrested for molesting one of my female friends, and my maternal grandfather, a second father to me, had just finished dying a terrible death from the asbestosis he got in the Navy in WW2. I was in the midst of my first major downswing mentally of what I’d learn years later was bipolar disorder. I would sit in my backyard and read books, listening to the wind and birds and occasionally the jackass down the street peel out in his rusty ’85 Camaro. I looked up from my book one day to see this beautiful gray kitten staring at me with those green eyes from atop the fence. He meowed softly. I had never had much to do with cats before, but I went and picked him up. He immediately started purring. I went back to my chair and he promptly curled up in my lap and went to sleep. I felt better than I had in a long time, idly stroking him while reading. He brought me peace. Every day after that, I’d go out to read to find him waiting for me. He’d crawl into my lap, and we’d share the afternoon. Spring warmed into summer, which reluctantly yielded to fall. Samson started meeting me at the door. Then he’d come in and nap on the back of the couch. My mom saw our special bond, how he’d come when I’d call him, how he’d put his paws on my thigh to be picked up, how he could make me smile while we played. She came home from work one day with litter and food, so he could stay as long as he wanted. Soon, he was sleeping on my bed with me. I could hear his happy purrs even when he was at my feet. This went on for a few years, him splitting his time between my house and the neighbor’s. One day he didn’t show up. I was worried, but not terribly so, as Samson loved running around outside and, as I would later learn, causing trouble. Next day there was a knock at my door. To my surprise, it was my neighbor’s whole family wearing big smiles, holding Samson who was wearing a big red bow. “Merry early Christmas!” they said. I nearly wept. He was already a member of the family. My mom loved him. My brother too, though he’d never admit it. He got along with our blind dog. It was a good time, and he helped me heal. But nothing is forever. He got older, slower. But there was still nowhere he’d rather be than in my lap. Then he stopped eating and drinking. I took him to the vet, who discovered lesions on his tongue. A blood test confirmed feline leukemia. We gave him IV fluids for a few days, but it was time, and I wasn’t ready. It was a long drive back to the vet clinic, yet also far too short. He lay on the table, unable to stand. I sat in a chair and took him into my lap. He started purring. The vet came in with syringes. 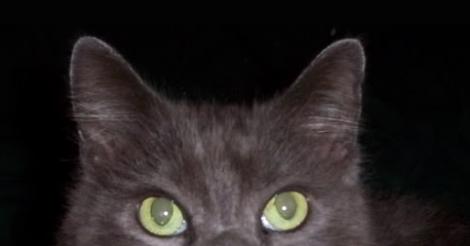 The purring stopped, those haunting green eyes focused on something only he could see. The vet gave me a blanket. He’s buried in the backyard, under the same pin oak we used to sit under. A little stone angel marks the place. I have had other cats, but there will never be another Samson. Rest in peace, my sweet friend.